LONDON, UNITED KINGDOM, February 10, 2019 /EINPresswire.com/ — The Litecoin Cash dev team are thrilled to be on Blockfolio Signal – and what a great time for us to make an entrance here. After many months of testing on testnet, The Hive became active on mainnet on Wednesday 6 Feb. The Hive is our brand new democratised mining concept, which features negligible energy cost and will help to protect the coin against 51% attacks. Users create bees, agent-based mining workers which earn rewards for their owners. As The Hive was deployed as a user-activated soft fork, it has required our existing SHA256 miners to vote to approve activation. Reception amongst the mining community was so positive that Hive activation became locked in at the earliest possible block, with the support of more than 90% of miners. As soon as the first bees created completed their maturation period, successful hivemined blocks were seen in the mainnet blockchain. 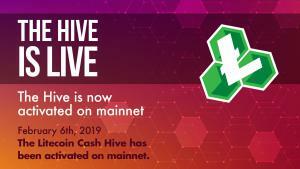 For more information, see our website (https://litecoinca.sh) and most recent whitepaper, The Hive: Agent-based mining in Litecoin Cash (https://hive.litecoinca.sh/whitepaper.pdf).